Zippers can be swapped with friends and moved around to create unique looking bags. If you're looking for the perfect gift for that teen or tween girl you know, or you enjoy fun and trendy handbags, you won't want to miss out on the zpr bag. LoveToKnow got the inside scoop on this little bag that is certain to become a huge hit during our zpr bag interview with designers Kat and Chris Costello. Founded in 2007, Green Alley, LLC is the owner of the zpr bag product and patent. The company is a husband-and-wife team, Chris and Kat Costello, based in Richmond, Virginia. Chris is a former creative director and copywriter with over 20 years of experience in advertising. Kat has over 13 years of domestic and international brand and advertising strategy experience. LoveToKnow (LTK): Have you designed any other fashion items or is this your first? ZPR Bags (ZB): This is our first and we are really excited about it! LTK: From the time you came up with the idea for the zipper handbag combo, how long did it take to get to this point where you are selling them and ready to hit national stores soon? ZB: It has been about three years, from the first hand sewn prototype to having inventory to sell to consumers. Most of that time was spent on product development, and specifically, on making sure we had the perfect zipper. The zipper has to be easy to use, strong, fashionable, and affordable. We went through almost 25 zippers before we found the right one. LTK: Since different pieces can be moved around and changed, can teens exchange with their friends, creating a unique friendship style purse? ZB: Yes. In fact, that is one of the best things about the zpr bag! We also are developing a party pack for birthdays and slumber parties, so more girls can share and exchange at the same time. LTK: How long does it take to piece a bag together or change out panels? ZB: 30 seconds or a minute. Once you see how it works, it's very simple. LTK: What are the costs of a zpr bag and how much does it cost to add new panels, interchange panels and refresh your look? ZB: The standard bag is sold on-line for $19.99 or a little more than $2 per "look". Additional strips go from $4.99 for the narrows, up to $9.99 for a set of two end pieces. LTK: You call it nine bags in one. Can you explain that a bit? ZB: Sure. The standard nylon bag has six pieces including the shoulder strap. By unzipping and re-zipping the strips in a different order or eliminating some strips, you can reconfigure one bag nine different ways to make different iterations or looks. Here is one example of a color combination that creates a bold statement. LTK: How man different colors are currently available? ZB: We have six colors - Zhoco-lot, Rozey Cheekz, Plumzy, Tealizious, Zandcastle, and Zublime - but there are thirty color combinations available. With additional strips, the color combinations you can create are virtually unlimited. LTK: What are the dimensions on your handbags? Do they come in different sizes or just one? ZB: The dimensions of the standard bag are 8 ½ inches wide x 6 ½ inches high with an adjustable shoulder strap. The bags are the perfect size for carrying lip gloss, an address book, extra pens and pencils, and there is even a pocket for a cell phone! The handbags are all one size because each bag has to work with every other zpr bag. LTK: What are your future plans for these bags? Any new designs coming out? ZB: We are already in development of strips with patterns (flowers, peace signs, seasonal symbols like snowflakes). We are also developing the technology to Build A Bag on-line and host design contests. There is also huge potential for limited edition series. LTK: Any other fashion items in the works? Matching zipper shoes and wallets maybe? ZB: Yes. The prototypes for the tote and messenger bags just arrived and should be in the market in early 2009. LTK: Right now the bag is available in select boutiques. Can readers order online? ZB: Absolutely! 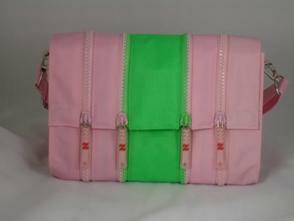 Readers can go to www.zprbag.com and click on the "shop" zipper pull to visit our on-line store. "When people read an article like this one, or we describe the product to them, or they see pictures, they often think they've seen it before. They haven't. Zpr bag is the only bag that lets you change the size and color anytime you want, as often as you want. You really have to see one and do it for yourself to appreciate just how revolutionary it actually is. LoveToKnow would like to issue a very warm thank you to Kat and Chris Costello and Jared Seeger for participating in this interview and congratulate them on creating such an interesting new handbag.